This insightful work explains how to spot and capitalize on market trends. 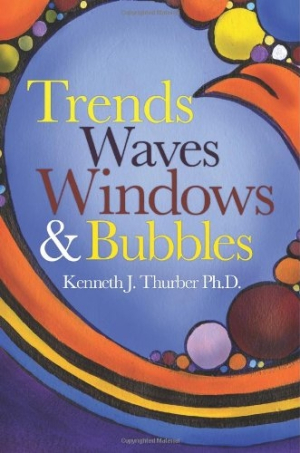 Individuals looking to take advantage of market trends would do well to read Kenneth Thurber’s thoughtful book, Trends, Waves, Windows & Bubbles. Thurber, whose previous two books discussed how to find high-growth companies (Big Wave Surfing) and how to create disruptive ideas (Do Not Invent Buggy Whips), turns his attention here to trend spotting. He explains not just trends but their various offshoots—waves, windows, and bubbles—and how each functions. Basically, Thurber believes that a trend creates a wave that can open a window of opportunity, but if a bubble forms (think housing bubble, for example), opportunity can be lost. In effect, Thurber details the process associated with how products enter the marketplace and become quickly irrelevant or lastingly influential. Not surprisingly, most of the examples he uses are from the information technology industry. In discussing the death of a trend, for instance, Thurber relates the story of CPT Corporation, a technology company that was making a full-featured word processing machine just before the IBM PC came to market. Obviously, the PC survived and CPT did not. Thurber uses additional well-chosen stories, along with an occasional graph or chart, to support the text. The book is divided into four parts, each covering one of the elements in the book’s title. Every part has a logical parallel structure: separate chapters define and help the reader visualize each element; discuss its importance; detail problems with the element; and demonstrate the decay, death, variations, and reinvention of each element. The chapters are succinct, the explanations are clear, and the text is easy to read. Thurber begins with a prologue and ends with an epilogue, tying up his argument in a tidy package. Thurber’s book is very well designed. Each part is identified with a subtly illustrated divider page and has a concluding section. The cover carries an attractive illustration surrounding the title. The book would have benefited from some biographical information about the author, as well as further descriptions of his previous two books. An appendix of additional resources might also have been helpful. Trends, Waves, Windows & Bubbles presents an excellent way for any reader to understand the life cycle of a market trend as well as how to potentially profit from it.